On Tuesday, the Village of New Denver passed a resolution at Council to reach 100% Renewable Energy by 2050. 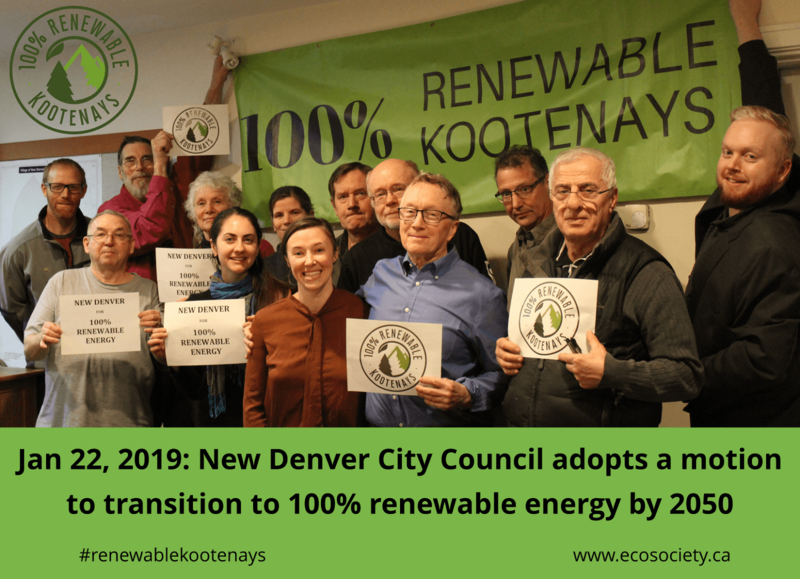 It was so exciting to see the Mayor and Council commit to 100% renewable energy, making New Denver the eleventh municipality in Canada and the fifth in the West Kootenays to be energy leaders. They join the City of Rossland – who just signed-on to 100% renewable energy earlier in the week – the Village of Slocan, the City of Nelson, and the Regional District of Central Kootenay in working towards this goal. I spent the past couple years working and studying in Ontario. One summer day there was a faint scent in the air that everyone was talking about. No one that I spoke with recognized where it was coming from, and they didn’t seem overly bothered by the smell – they were just curious. After working in the forest industry in BC for several years, I knew that it was the smell of a forest fire – there was that familiar lingering dry, yet almost humid and dirty taste in the air. At around the same time, I had spoken with my friend Karla, who was living in the Kootenays. She said that she experienced more than 20 straight days of breathing in smoke. She told me that it just wouldn’t go away; that it was there when she woke up in the morning and it was there all day until she went to bed at night. There was no mystery about where the smoke was coming from either. Everyone in BC was talking about it and it was all over the news. 2017 and 2018 were record-setting years for forest fires in BC, and we know that this trend towards hotter, drier summers in BC is not going to change any time soon. And it is taking more and more taxpayer dollars to battle the growing wildfire season. It truly is an emergency, and it is an emergency that can only get better if we drastically reduce carbon pollution, and transition to 100% renewable energy starting today. While these minor, and manageable forest fires were popping up in Ontario, I was working for Oxford County, helping develop their 100% renewable energy plan, and studying for my Masters at Queen’s University’s School of Urban and Regional Planning. Now that I have moved back to BC, I am glad that I can bring the knowledge that I gained while working and studying in Ontario back with me to inform the development of the 100% renewable energy strategies that our West Kootenay communities are now committed to. Oxford County has had a number of great successes, and as a rural County, it shares many similarities to the Kootenays, including a population of about 110,000 that is spread across a number of small cities, towns and hamlets, as well as a Council and staff that are active and ambitious in their aims to achieve this goal. What’s more, Oxford started working on this goal in 2016, and has since developed a strategy that is based on a set of best practices agreed upon by an international group of cities and towns that share the same goal of 100% renewable energy by 2050. This plan includes well-developed baseline energy-use data that will allow progress towards 100% renewable energy to be tracked over time, by sector. There have also been several initiatives that have already moved forwards, including installing solar panels on the roofs of a number of the County-owned buildings, as well as the establishment of a stakeholder committee to guide the development of the plan. West Kootenay Communities are well positioned to move towards 100% renewable energy, with communities like Oxford County, ON as collaborators. There are new policies in place by provincial and local governments in BC that are starting to help everyday citizens find affordable ways to transition to a low-carbon way of life. From incentives for people to retrofit their homes to require less natural gas for heating, to providing financial incentives for electric vehicles for transportation, “doing your part” is getting easier and becoming more affordable. I knew that moving to the Kootenays and working for the West Kootenay EcoSociety to help leading communities like New Denver and Rossland develop strong plans to reach 100% renewable energy by 2050 was the best way that I could do my part to help reduce carbon pollution and be part of the greater solution. Two and a half years ago, Oxford County, ON and Vancouver, BC were the only two cities in Canada that had set goals to reach 100% renewable energy, and now there are 11 local and regional governments committed to making this ambitious, yet attainable goal across the country. And there are over 250 more across the globe. It’s a movement. A big congratulations is in order for the New Denver saying yes to 100% renewable energy by 2050. It was truly a great moment, with a room full of residents in support, and our petition delivered that showed almost 40% of New Denver residents signed-up to say yes to green jobs, healthy community, and clean energy. The community is behind this and I can’t wait to start working with local governments to build a regional-municipal joint strategy to achieve carbon-neutrality while building strong, healthy, and resilient communities. Matt Murray is EcoSociety’s new Energy Planning Director who is working with local governments committed to 100% renewable energy to develop a strategy to achieve this ambitious goal.